We started the day by doing a bit of gambling at the recently-renovated Tropicana. We’d been to the updated Trop on a previous trip where we took the Mob Experience tour. This time, we just played a few slots, including our new favorite slots, Ghostbusters. The interactive game isn’t hard to find – even many of the older casinos downtown have it – and it makes good use of the ’80s film featuring Bill Murray, Dan Aykroyd, Harold Ramis, Rick Moranis, Ernie Hudson, Slimer and the Stay Puft Marshmallow Man. The chair that you sit in to play is equipped with speakers so that the sound of reverberates – this makes the game particularly exciting when you enter bonus rounds and must find and exterminate ghosts. From the Tropicana we took a long walk along The Strip to the Wynn for the resort’s lunch buffet. Though pricey, the Wynn buffet is terrific because it offers a number of vegetarian and even vegan options in addition to the usual assortment of pizza, pasta and meats. The vegan black bean enchiladas were delicious and didn’t lack any flavor being dairy-free. In addition to gelato, frozen non-dairy options included coconut and strawberry sorbet, and we’re also big fans of the vegan chocolate chip cookies. We wanted to see a show of some sort and given that we’ve seen most of the shows that were playing (the best being Le Reve, Beatles LOVE, Penn & Teller and Viva ELVIS pretty much in that order), our options were limited. 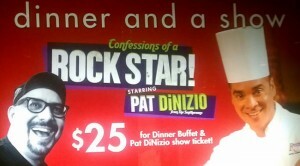 We were intrigued that Smithereens’ singer Pat DiNizio was performing a show he called “Confessions of a Rock Star” at the Riviera and Tix4Tonight, the discount broker that has kiosks located up and down the strip, had discounted tickets, so we bought a pair. 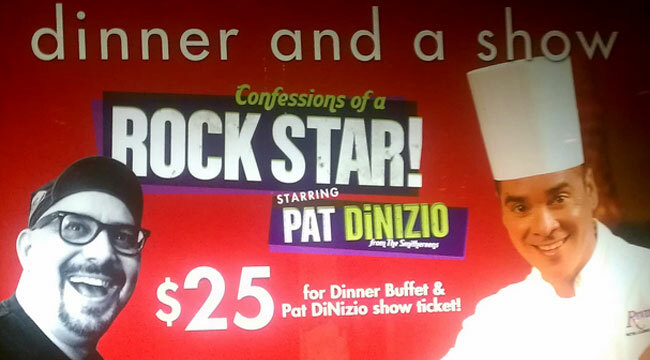 (The Riviera had a dinner and a show deal, but we weren’t interested in a meal.) The Riviera also had an affordably priced comedy show that started right after DiNizio’s show so we bought discounted tickets for it, too. All four tickets set us back less than $80. It was a good thing we didn’t opt for the more expensive reserved seats for the DiNizio show – the crowd was so small, we sat in the second row. DiNizio began the show with an overview of his life. He grew up in New Jersey where we worked in the family business as a garbage collector before getting his musical break at age 31. He showed some old photos and told stories about his parents and his musical idols – he saw the Ventures at a county fair and knew he wanted to front a band. The narrative is not particularly linear – DiNizio constantly switched between present-day and the past – but DiNizio doesn’t sugarcoat his upbringing, either. He also admits to being star-struck when he met Beatle Paul McCartney at a party and when he talked to Madonna on the phone after she apologized to him because she couldn’t make it to the studio to sing backing vocals on “A Girl Like You.” Backed by a capable bassist and guitarist, DiNizio performed all the Smithereens big hits (he dedicated “Only a Memory” to his late father) and a few covers. All in all, it was a fine mix of performance/narrative, but it seemed sort of ill-suited for a Vegas stand at the Riv (maybe House of Blues or Hard Rock?) and it’s not like The Smithereens were one of the ‘80s more significant acts, which perhaps explains why the performance ended up being so intimate with maybe 30 of us concentrated at the front of the room. DiNizio was extremely gracious to those who did attend and spent time meeting us each personally. Given that the price of the comedy tickets were so low, we didn’t expect much from the comedy show, but the club had hired a couple of veterans. Shayma Tash went on first. Her beginning set of Vegas-themed jokes fell flat, but she soon developed a good rapport with the audience, in part because she was so good-natured. Her imitation of the excessively-cheerful Shopping Network woman was spot-on, and she was more than capable of improvising. It was a bit off-putting then, when Larry Reeb followed. A veteran comic, the guy comes off (intentionally) as a dirty old man with a routine full of one-liners often punctuated by “that’s another tip from your Uncle Larry.” He made us laugh a few times, but his set seemed awkwardly paired with Tash and his confrontational personality ran a littel thin.